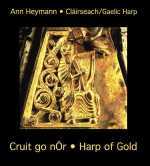 Cruit go nÓr • Harp of Gold proves yet another milestone for Gaelic harp pioneer Ann Heymann. In it she places her clairseach (KLAR-shuk) squarely within its original context: the music of its golden age, where its nobility shines as brightly as its gold strings. The selections represent a millenium of musical traditions within which the Gaelic harp flourished. The repertory ventures from the monastic cell to the Chieftain's Great Hall and the English Royal Court, while the sources range from Irish mythology to notated manuscripts and remnants of an early, largely unwritten tradition.